As designers, we’re constantly swimming in constraints. Some are obvious, while others we may not even be aware of. Below I’ll discuss some of them. Technical constraints. These are more of an issue for digital games, but even tabletop games have limitations based on what’s possible to create. How can you test or play something you can’t physically produce? And even if you can create a mock up of what you’d eventually like, there’s no guarantee it will be possible to mass produce it, at least within your budget. 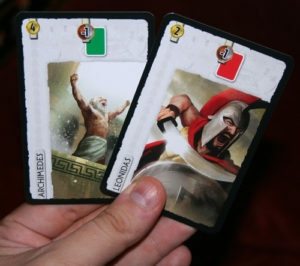 These technical constraints often lead to games featuring similar components, like cards and standard dice. Cultural constraints. Here I don’t mean what’s socially acceptable (Cards Against Humanity rejects that and is doing just fine). No, I mean that players are going to have to learn how to play your game, so it needs to be explainable. This is one reason many common conventions are used over and over: players immediately know that decks are shuffled and face down and that hands are hidden to everyone except you. If your design strays too far from what players expect, you’ll have a very challenging time teaching the game, especially when you’re not there to help. Not only will you have to teach something new, you’ll have to fight existing expectations and habits. Physiological constraints. Players only have two hands. They only have three types of color receptors in their eyes. Most can only store a dozen pieces of information in their memory at any given time. If you’re making games you expect humans to play, you have to consider human limitations while you’re designing. Thematic constraints. If you’re approaching a new design with a theme in mind, as many of us do, that will contribute many limitations. There will be certain aspects of the theme that must be included, and certain mechanics and components that just won’t make sense. On top of that, players will have certain expectations for certain themes in terms of the weight and quality of the overall experience. All that said, I think many designers let theme constrain them much more than they should. Expansions must work within the mechanics established by the base game. Image from Board Game Geek. Mechanical constraints. When you need to create new content for an existing game system, be it for an expansion or just late in the design process, the way the game works will limit what’s possible. This is often called design space, and games with large design space can handle lots of different components and special rules. But remember that even though a game system has a large design space and is therefore easier to create new content for, that doesn’t mean it’s better than a game with little design space. Audience constraints. Are you making a game for children? That will limit how much reading and math you can include in your game. Families? Don’t let things get too nasty. Veteran Euro gamers? Be careful about adding too much output randomness. Whatever your target audience is, it will help define what’s acceptable in your game. Client constraints. If you’re working for or with someone else, they’ll have ideas about what the game should be, and that will constrain what the game can be. Financial constraints. Many of the above constraints, especially technical ones, really boil down to financial constraints. If you had enough money, you could make just about anything work. But in the real world, a lack of money (and a necessity to produce a game that can be appropriately priced) often prevents us from doing exactly what we want to do. Self imposed constraints. When you get really excited about a new idea, it’s not uncommon to completely warp your thinking around it. It might be hard to imagine creating anything that doesn’t include the new idea, be it a cool component, a unique mechanic, a fun theme, or a title with a clever pun. Whatever their form, we all impose constraints on our own games, often without recognizing them as such. While one of the big messages of this post is that constraints are not bad, I encourage you to always be mindful of self imposed constraints. Designers often artificially limit their imaginations with them, and don’t even realize they’re doing it. While many constraints are real and can’t be avoided, self imposed constraints can always be rejected with enough will power and self reflection. Solving problems. Constraints may seem like problems, but in reality they solve many problems before you even realize they are problems. You can only afford to use standard dice… guess what, you don’t have to worry about the range or probabilities of your random values! Are you making a game for people flying on airplanes? Then you probably don’t need to worry about a board or pieces that will topple over during turbulence. It’s true that constraints do introduce problems for designers and publishers to solve, but they also offer many solutions that often go unnoticed and underappreciated. Offer guidance. Looking at a blank sheet of paper can be overwhelming and intimidating. Where do you even start? But if you come at it with a thematic idea, you can immediately start thinking about how the elements of that theme might fit together mechanically. Or if you start with a mechanic, you can start exploring what that mechanic allows. Constraints give us a push in the right direction. Without them, we might wander aimlessly. Even using print on demand, Daniel Solis established card limits for his games to make them affordable, and came up with some gems! Image from Board Game Geek. Force creativity. While constraints can solve problems, they can also complicate existing problems. Scoring is easy when you have a track or tokens, but what about when your whole game is 54 cards? By forcing you to approach a problem from a different angle, constraints can force us to ditch the status quo and come up with new, original solutions to problems that we never would have considered without something forcing us to approach the problem from a fresh perspective. And when things go really well, those new solutions can help make a game stand out, or possibly even become the centerpiece of the game. I recently designed my most constrained game piece ever, the Owl Bear for Birds of a Feather, and I thought sharing the experience might help illustrate some of the concepts I discussed above. A few months ago, Geek & Sundry requested special promo items from publishers for their upcoming International Tabletop Day. I’d never done anything like that before, but I’ve made it a goal to be better about marketing, especially taking advantage of unusual opportunities. Since the Owl Bear is a bit of a mascot for Tabletop, and since owl bears are half bird, I figured it was worth suggesting an Owl Bear promo card for Birds of a Feather to them. I never thought they’d accept it… but they did! Financial constraints: I’m not made of money. If at all possible, I wanted to keep the promo a single card to keep costs down. Mechanical constraints: Possibly the biggest constraints came from integrating a new element into an existing, pretty tightly designed game. 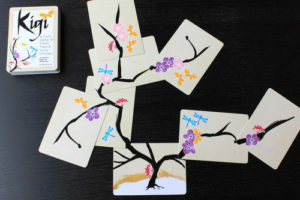 Birds of a Feather has 35 unique cards, all of which are represented on a score sheet. There are five suits (habitats) which are all symmetric. Players do not take turns; all actions are simultaneous. How could a single new card be introduced into such a system? Thematic constraints: There’s a lot of wiggle room with adding a fantasy creature to a game, but the new card needed to be exciting, and if possible incorporate the “gotcha” quality that the Tabletop Owl Bear often embodies. 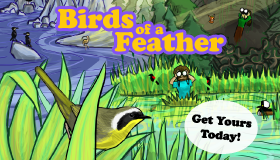 Audience constraints: Many people will get their first introduction to Birds of a Feather with the Owl Bear promo card, so it’s important that it isn’t extremely complicated or difficult to learn. Players should be able to play their first game of Birds of a Feather with the Owl Bear and not feel overwhelmed or confused. With these constraints in mind, I went about experimenting with different ideas. Should the Owl Bear be a wild card, letting you explore any habitat you want? Should the Owl Bear act like an anti-raptor, canceling their special ability or scaring them away? Should the Owl Bear scare all of a certain type of card, or give the player lucky enough to get it the ability to play two cards in the next round? Technical constraint: The Owl Bear card would not be able to be shuffled into the deck and dealt out like the rest of the cards in the game. Given time and money limitations, we couldn’t go with the original printer for the game, meaning the card stock and colors would be different from the original game. All of the ideas I’d played around with had assumed the Owl Bear would act like any other card from the game, but that wasn’t going to be possible. What was I going to do? I talked it over with some friends and playtesters, and we came up with the idea that players would compete for control over the Owl Bear by playing cards as normal. The simultaneous play and symmetric aspect of the game made this a little challenging, but also led to a really fun idea: what if no one got the Owl Bear if there was a conflict? If two players tried to get it this round, then no one gets it. Playtesting showed that this idea worked really well, creating some fun and interesting tension. After deciding how players would gain the Owl Bear, the question became what would the Owl Bear do for them? The simplest idea was to just add points for the player who ended the game with the Owl Bear, but that felt a little lackluster. The scoring system in the game, and the app in particular, greatly limited how the card could add to scoring, but a great suggestion from a playtester proved really fun: when you gain control of the Owl Bear, you can check off another bird of your choice. After lots more playtesting, we confirmed that the promo card was a really fun addition to the game, and it was off to the printer! 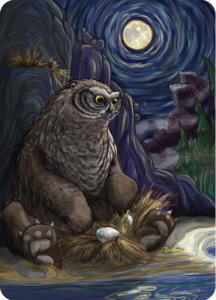 The Owl Bear did not turn out at all like I imagined it would when I first proposed it. But I’m happy to say it’s a great, beautiful addition to Birds of a Feather. Thanks, constraints! I’m really excited to see the reception to the Owl Bear. Make sure to get your copy at a local International Tabletop Day near you and let me know what you think! I would like to thank my generous Patrons whose support and encouragement made this article possible. I’ve had a great time playing Birds of a Feather with people who normally are not into games, and the Owl Bear card sound like a fun addition. Do you think there would be more chances to get this card latter on, for those of us who aren’t near a Tabletop Day hosting store? I don’t have anything planned at this point, but I will look into it! Hey Teale! Sorry it took so long to get out a response to this article. but I’m with ya…I can’t sing the praises of constraints loud enough! There’s no way our current game would exist had it not started from the initial constraint of a standard deck of playing cards. Fortunately through lots and lots of testing, we’ve discovered clever ways to break away slightly from that constraint and the game is stronger for it, but it couldn’t have gotten here from a blank sheet of paper.